Have you been thinking about trying dance but aren’t sure how to get started? 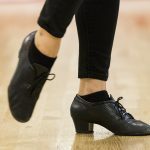 Looking to get back to dance but want to brush up on your basic skills before hitting the social scene with a partner? Our Friday night Intro. to Partnership Dance class is for you! Join Jason Saxe every Friday in April at 7:30 p.m. (no class April 26) for a fun and energetic class covering the basics of partnership dancing. This class is for single dancers and couples alike. Inquire at the front desk for more details or just drop in this Friday night at Booth Dancesport at The Savoy at Curtis Park! $20 per person. Various dance styles will be covered. Kick off you weekend with a great dancing vibe! This entry was posted in Contact, Dance Lessons, Group Lesson, News. Bookmark the permalink. ← Competition Season is Here! Be Ready with Booth!